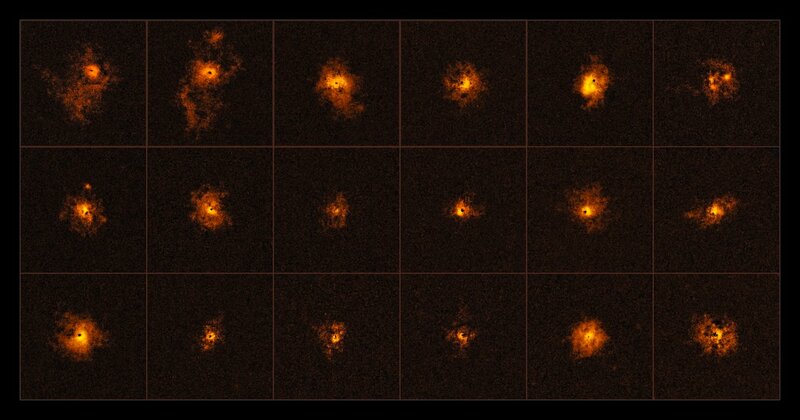 An international team of astronomers has discovered glowing gas clouds surrounding distant quasars. This new survey by the MUSE instrument on ESO’s Very Large Telescope indicates that halos around quasars are far more common than expected. The properties of the halos in this surprising find are also in striking disagreement with currently accepted theories of galaxy formation in the early Universe. An international collaboration of astronomers, led by a group at the Swiss Federal Institute of Technology (ETH) in Zurich, Switzerland, has used the unrivalled observing power of MUSE on the Very Large Telescope (VLT) at ESO’s Paranal Observatory to study gas around distant active galaxies, less than two billion years after the Big Bang. These active galaxies, called quasars, contain supermassive black holes in their centres, which consume stars, gas, and other material at an extremely high rate. This, in turn, causes the galaxy centre to emit huge amounts of radiation, making quasars the most luminous and active objects in the Universe. The study involved 19 quasars, selected from among the brightest that are observable with MUSE. Previous studies have shown that around 10% of all quasars examined were surrounded by halos, made from gas known as the intergalactic medium. These halos extend up to 300 000 light-years away from the centres of the quasars. This new study, however, has thrown up a surprise, with the detection of large halos around all 19 quasars observed — far more than the two halos that were expected statistically. The team suspects this is due to the vast increase in the observing power of MUSE over previous similar instruments, but further observations are needed to determine whether this is the case. “It is still too early to say if this is due to our new observational technique or if there is something peculiar about the quasars in our sample. So there is still a lot to learn; we are just at the beginning of a new era of discoveries”, says lead author Elena Borisova, from the ETH Zurich. The original goal of the study was to analyse the gaseous components of the Universe on the largest scales; a structure sometimes referred to as the cosmic web, in which quasars form bright nodes . The gaseous components of this web are normally extremely difficult to detect, so the illuminated halos of gas surrounding the quasars deliver an almost unique opportunity to study the gas within this large-scale cosmic structure. The 19 newly-detected halos also revealed another surprise: they consist of relatively cold intergalactic gas — approximately 10 000 degrees Celsius. This revelation is in strong disagreement with currently accepted models of the structure and formation of galaxies, which suggest that gas in such close proximity to galaxies should have temperatures upwards of a million degrees. The cosmic web is the structure of the Universe at the largest scale. It is comprised of spindly filaments of primordial material (mostly hydrogen and helium gas) and dark matter which connect galaxies and span the chasms between them. The material in this web can feed along the filaments into galaxies and drive their growth and evolution. MUSE is an integral field spectrograph and combines spectrographic and imaging capabilities. It can observe large astronomical objects in their entirety in one go, and for each pixel measure the intensity of the light as a function of its colour, or wavelength. This research was presented in the paper "Ubiquitous giant Lyα nebulae around the brightest quasars at z ~ 3.5 revealed with MUSE", to appear in the Astrophysical Journal. The team is composed of Elena Borisova, Sebastiano Cantalupo, Simon J. Lilly, Raffaella A. Marino and Sofia G. Gallego (Institute for Astronomy, ETH Zurich, Switzerland), Roland Bacon and Jeremy Blaizot (University of Lyon, Centre de Recherche Astrophysique de Lyon, Saint-Genis-Laval, France), Nicolas Bouché (Institut de Recherche en Astrophysique et Planétologie, Toulouse, France), Jarle Brinchmann (Leiden Observatory, Leiden, The Netherlands; Instituto de Astrofísica e Ciências do Espaço, Porto, Portugal), C Marcella Carollo (Institute for Astronomy, ETH Zurich, Switzerland), Joseph Caruana (Department of Physics, University of Malta, Msida, Malta; Institute of Space Sciences & Astronomy, University of Malta, Malta), Hayley Finley (Institut de Recherche en Astrophysique et Planétologie, Toulouse, France), Edmund C. Herenz (Leibniz-Institut für Astrophysik Potsdam, Potsdam, Germany), Johan Richard (Univ Lyon, Centre de Recherche Astrophysique de Lyon, Saint-Genis-Laval, France), Joop Schaye and Lorrie A. Straka (Leiden Observatory, Leiden, The Netherlands), Monica L. Turner (MIT-Kavli Center for Astrophysics and Space Research, Massachusetts Institute of Technology, Cambridge, Massachusetts, USA), Tanya Urrutia (Leibniz-Institut für Astrophysik Potsdam, Potsdam, Germany), Anne Verhamme (University of Lyon, Centre de Recherche Astrophysique de Lyon, Saint-Genis-Laval, France), Lutz Wisotzki (Leibniz-Institut für Astrophysik Potsdam, Potsdam, Germany).